Low prices, reasonable quality and a diverse selection have made IKEA one of the most successful chains of its kind. However, these factors alone are simply not enough to satisfy us green shoppers looking for superb quality and eco cred, so I did some digging to discover what measures this popular store is taking to fulfill their environmental responsibility. From production methods to materials used, IKEA enforces stringent rules in their effort to be more eco-conscious. “When we design new products we consider the environmental consequences at every stage in a product’s life cycle,” IKEA designer Monika Mulder proudly declares. But, what exactly does this assertion mean? Well, to start, inspectors visit suppliers at least every couple of weeks to check for efficient production, responsible waste disposal and fair working conditions. In addition, IKEA takes steps to ensure that the timber used in their products only comes from responsibly managed forests. 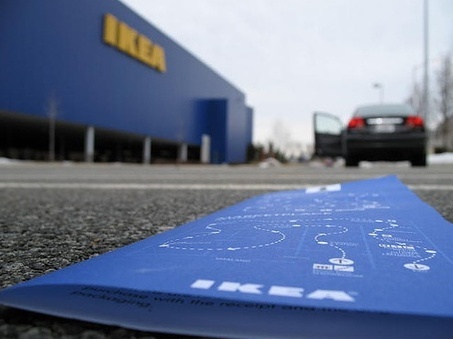 “In many countries where IKEA products are made, intact natural forests are under threat. We trace the timber all the way back to where it was felled to ascertain its origin,” states one of their personal forest managers, Kjell-Owe Ahlskog. IKEA also utilizes renewable resources like rattan and bamboo. However, one fact that many eco-friendly shoppers aren’t aware of is that rattan is commonly boiled in diesel oil for maximum pliability. When inspectors discovered that suppliers practiced this method, they switched to palm oil instead to eliminate hazardous fumes for both workers and consumers. The only problem? All of their eco-friendly products are mixed in with the rest, both on their web site and in their stores. Even though all of their employees receive environmental training, we eco connoisseurs know that green wisdom requires more than a single session. Clear labels would go a long way! Further reading: How Green Is Target?